The National Institute for Occupational Safety and Health (NIOSH) issued four new publications in May on firefighter safety. All four documents address the risks of firefighters developing rhabdomyolysis, a serious and sometimes fatal condition that can develop from exposure to heat and prolonged, intense exertion. NIOSH says healthcare providers can prevent debilitating consequences in firefighters by being alert to the signs and symptoms of rhabdomyolysis. The condition can be misdiagnosed as heat stress or dehydration, as the presenting signs and symptoms can be similar. Exposure to heat from the fire, the environment, and physical effort. Dark-colored urine (tea- or cola-colored). NIOSH cautions that symptoms of rhabdomyolysis do not always appear immediately after exertion, but may develop several days after the muscle is damaged. Firefighters should be sure to let their healthcare providers know about their jobs and their increased risk for rhabdomyolysis. 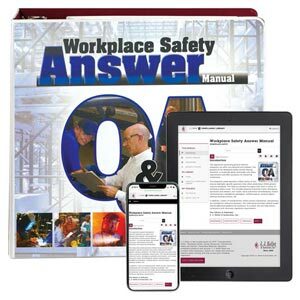 J. J. Keller's Workplace Safety Answer Manual provides a single-source manual that offers quick answers to a wide array of workplace safety questions.